Alan Menken and Howard Ashman. Howard Ashman and Alan Menken first teamed up in 1979 to write the lyrics and music for a show at the WPA Theater. That first collaboration didn’t go too well, but their second, Little Shop, became a smash. In 1987, Ashman was tapped by Disney to write the lyrics for a song in Oliver & Company (probably due to the success of Little Shop) after which he was given the choice of projects to work on. He chose Little Mermaid, and brought Menken on board as collaborator. Together, they brought a dramatic mentality to the project that it was lacking, influencing the structure of the plot and songs to function more like a work of musical theater, the songs just as important as the spoken dialogue in telling the story. By virtue of having the same lyricist and composer, whose songs form the backbone of the plot, the two works actually have quite a few similarities. But, in my opinion, nowhere is Ashman & Menken’s common influence more apparent than in their villains. On a superficial level, we can already see a few similarities in terms of performance. These are both big-bodied villains who know how to haul their weight around, using their low, raspy voices and tentacles/vines to put their points across. 2.The villain manipulates the hero to do what they want. Both “Poor Unfortunate Souls” and “Git It” fall into the second category. So, how do they get the protagonists to do what they want them to do? They pretend they are subservient to the hero’s desires. 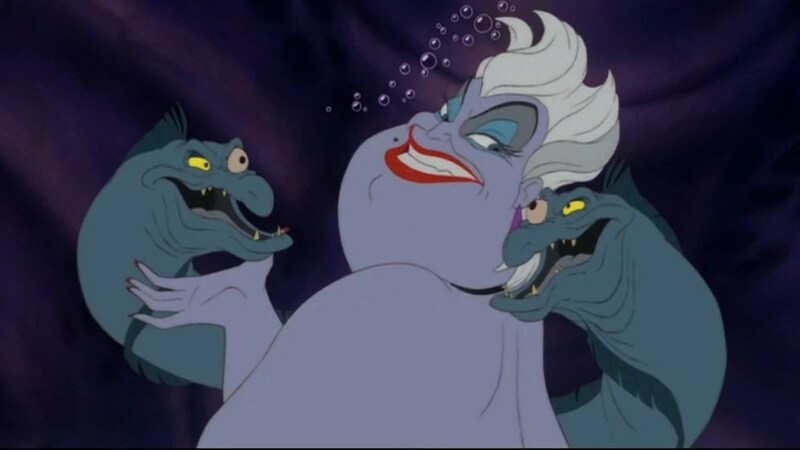 Ursula appears compassionate, insisting she has repented from using magic for selfish gain and now only serves “poor unfortunate souls.” The Audrey II, though it comes on stronger than Ursula, tells Seymour, “Hey, I’m your genie, I’m your friend/ I’m your willing slave!” (which is strangely prescient of Aladdin‘s “Friend Like Me,” also composed by Ashman & Menken), and telling Seymour it can give him everything he wants. Of course, there’s always a price. And though both villains frame their price as minor and fair, I would say selling your voice and freedom/killing people to feed a hungry plant is a pretty steep price. On top of that, Ursula holds that Ariel has to get her prince to kiss her in three days (which, without her voice, even romantic Ariel doubts will be possible) or the potion will stop working! They encourage the hero to be something they are not, to transform themselves. The Audrey II tempts Seymour with visions of cleaning up his complexion and dress, hanging out at The Ritz with celebrities. Seymour, who has a low self-image, doesn’t take long to give into the illusion, imagining himself as a dominant James Dean-biker type. As for adventurous Ariel, she may have been willing to become a human to go on land, but she probably didn’t intend for it to be forever… and certainly didn’t think about giving up her voice. Ursula basically devalues Ariel’s voice and encourages her to be a shallow wallflower, framing it as the only way she can get what she wants (interestingly, you could say each villain encourages the hero to follow restrictive gender norms, but that might be over thinking it). They use love against the protagonist. Indeed, you could say it’s the thing that clinches the deal. Ursula uses Ariel’s desire to see Eric again to get her to agree, makes their whole deal revolve around love. Ariel, fresh off her father’s disapproval, wants someone to connect to badly, so she agrees to the deal. 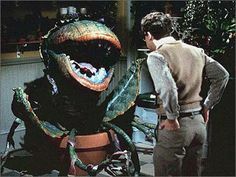 Audrey II uses Seymour’s love for the Audrey I to awaken his hatred for her abusive dentist boyfriend (at which point said boyfriend conveniently slaps Audrey right in front of him), thus marking him as the first victim. Both villains will later attempt to kill said love interests as well (which the Audrey II succeeds in, sadly). It’s interesting what themes can occur across an artist’s or team of artists’s body of work. It gives us insight into what the artists care about. In the case of Ursula and Audrey II, we see Ashman and Menken concerned about the sacrifices we are willing to make to get what we want, and how it can be used against us. I think as much as Disney feels it owes to Howard Ashman, The Little Mermaid owes at least a little of its success to Ashman and Menken’s previous work. With Ursula, we see a little of the Audrey II with a more subtle, charming manner, but all the attitude and all the evil in tact. I hope this gives the musical, and the composers, a little more exposure. Look for a new post next Monday. Learn more about the blog here, about me here, and resources here. Check out the links for related works and Pinterest boards, and leave a comment to let me know if you have any thoughts or ideas. UPDATE 11/17/14: Hey, it’s the 25th Anniversary of The Little Mermaid! I didn’t even realize that was coming up when I wrote this, but great timing! * — The 1986 film almost had the same ending, but test audiences panned it, causing them to refilm it as a happier one where Audrey doesn’t die and Seymour defeats the plant. Personally, I’m fond of this ending as well. ** – The songs “Suppertime” and “Sominex/Suppertime reprise” (play)/ “Mean Green Mother from Outer Space” (movie) can also count as villain songs for Audrey II, but “Git It (Feed Me)” is the first time it voices its desires, and the first time it tempts Seymour to become a murderer. ***– It should also be noted that, when The Little Mermaid was brought to Broadway, the Act I finale was “Poor Unfortunate Souls.” “Git It” falls near the end of Act I in Little Shop of Horrors, so both villain songs also fall at about the same point in their respective shows.